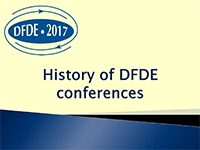 The history of the conference goes back to 1994, a hard time for Russian science, when the first "International Conference on Functional Differential Equations and Applications, Moscow, Russia, August 14–21, 1994" was held on the basis of the Moscow Aviation Institute in cooperation with the Russian Academy of Sciences and the Moscow Mathematical Society. More than 80 mathematicians from the former Soviet Union and 20 foreign mathematicians took part in that conference. Among them there were the well-known scientists such as M.S. Agranovich (Russia), A.G. Baskakov (Russia), T.A. Burton (USA), R. Datko (USA), R.I. Grigorchuk (Russia), J. Kato (Japan), N.D. Kopachevskii (Ukraine), M.A. Krasnosel'skii (Russia, he opened the conference), A.D. Myshkis (Russia), V.S. Pugachev (Russia), A.L. Skubachevskii (Russia), S.M. Verduyn-Lunel (Netherlands), V.V. Vlasov (Russia). The second event was the "International Conference on Differential and Functional-Differential Equations, Moscow, Russia, August 16–21, 1999." It was also organized by the Moscow Aviation Institute together with the Steklov Mathematical Institute and the Moscow Mathematical Society, and it was dedicated to the 275th anniversary of the Russian Academy of Sciences. This time, more than 150 mathematicians participated in the conference, about 30 of them from foreign countries. The conference was opened by a lecture of academician D.V. Anosov (Russia). The following well-known mathematicians also lectured at that conference: H. Amann (Switzerland), A. Ambrosetti (Italy), W. Balser (Germany), A.A. Bolibruch (Russia), V.M. Buchstaber (Russia), W. Jäger (Germany), Ch. Kassel (France), V.A. Kondrat'ev (Russia), L.D. Kudryavtsev (Russia), S.B. Kuksin (UK), V.B. Lidskii (Russia), C. Mitschi (France), A.D. Myshkis (Russia), S.M. Nikolskii (Russia), J. Qing (USA), N.H. Rozov (Russia), G.A. Seregin (Russia), R. Schäfke (France), A. Tesei (Italy), L. Veron (France), M.I. Vishik (Russia), L.R. Volevich (Russia), and many others. The next "International Conference on Differential and Functional Differential Equations, Moscow, August 16–22, 2002" was held in Moscow Aviation Institute jointly with the Steklov Mathematical Institute, the Moscow Mathematical Society, and the Weierstrass Institute for Applied Analysis and Stochastics. It was a satellite of the International Congress of Mathematicians in Beijing (ICM-2002), which seems to be unique taking into account the distance between the cities. This fact is surely the evidence of the highest scientific level of the conference. More than 200 mathematicians participated in that conference, about 60 of them from foreign countries. The opening ceremony took place in the President Hall of Presidium of the Russian Academy of Sciences, and it was S.P. Novikov who opened the conference. The lectures were also given by H. Amann (Switzerland), N.S. Bakhvalov (Russia), W. Balser (Germany), N.A. Bobylev (Russia), A.A. Bolibruch (Russia), V.M. Buchstaber (Russia), S. Yu. Dobrokhotov (Russia), Yu.V. Egorov (France), Yu.S. Ilyashenko (Russia), H. Kimura (Japan), N.D. Kopachevskii (Ukraine), L.D. Kudryavtsev (Russia), M. Loday (France), D. Lutz (USA), B. Malgrange (France), J. Mather (USA), J. Qing (USA), A.G. Sergeev (Russia), A.A. Shkalikov (Russia), V.A. Solonnikov (Russia), L. Veron (France), H.-O. Walther (Germany), J. Wu (Canada), V.M. Zakalyukin (Russia), V.G. Zvyagin (Russia). The Fourth International Conference on Differential and Functional Differential Equations, Moscow, August 14–21, 2005, was held in the Steklov Mathematical Institute jointly with the Moscow State University and the Moscow Mathematical Society. More than 130 mathematicians participated in the conference, about 30 of them from foreign countries. The lectures were also given by such well-known mathematicians as A. Agrachev, M.S. Agranovich, A.B. Antonevich, C. Bardos, V.M. Buchstaber, V.I. Burenkov, S. Yu. Dobrokhotov, Yu.A. Dubinskii, B. Fiedler, K. Hadeler, A.M. Il’in, N.M. Ivochkina, W. Jäger, H. Karcher, V.A. Kondrat’ev, S.P. Novikov, V.A. Pliss, A. Sarychev, G.R. Sell, G.A. Seregin, A.G. Sergeev, Ya.G. Sinai, V.D. Stepanov, A. Tesei, F. Tomi, D.V. Treschev, L. Veron, M.I. Vishik, L.R. Volevich, I.V. Volovich, H.-O. Walther, P. Yang, V.V. Zhikov. The Fifth International Conference on Differential and Functional Differential Equations, Moscow, August 17–24, 2008, was held in the Peoples' Friendship University of Russia jointly with the Steklov Mathematical Institute and Moscow State University. About 140 mathematicians participated in the conference, 32 of them from foreign countries. The lectures were also given by such well-known mathematicians as A.L. Afendikov, M.S. Agranovich, S. Bianchini, V.M. Buchstaber, G.-Q. Chen, S.Yu. Dobrokhotov, Yu.A. Dubinskii, B. Fiedler, A.V. Fursikov, H. Ishii, W. Jäger, E.Ya. Khruslov, N.D. Kopachevsky, A. Kozhevnikov, V.V. Kozlov, S.B. Kuksin, E. Lanconelli, D.Li, V.A. Marchenko, J. Mather, P. Mironescu, L. Nirenberg, S.P. Novikov, S.I. Pohozaev, V.V. Pukhnachev, V.S. Rabinovich, G.R. Sell, L.P. Shilnikov, A.E. Shishkov, Ya.G. Sinai, I.A. Taimanov, D.V. Treschev, L. Veron, M.I. Vishik, H.-O. Walther, V.G. Zvyagin. The Sixth International Conference on Differential and Functional Differential Equations, Moscow, August 14–21, 2011, was held in the Steklov Mathematical Institute jointly with the Peoples' Friendship University of Russia and Moscow State University. More than 170 mathematicians participated in the conference, including over 30 of them from foreign countries. The lectures were also given by such well-known mathematicians as M.S. Agranovich, D.V. Anosov, S. Bianchini, V.M. Buchstaber, I. Capuzzo Dolcetta, A.A. Davydov, M. del Pino, N. Dencker, S.Yu. Dobrokhotov, Yu.A. Dubinskii, T. Fisher, H. Ishii, W. Jäger, V.V. Kozlov, P. Mironescu, S.P. Novikov, A.L. Piatnitski, S.I. Pohozaev, G. Sell, A.G. Sergeev, L.P. Shilnikov, A.E. Shishkov, A.A. Shkalikov, D. Shoikhet, A.P. Soldatov, Ya.G. Sinai, I.A. Taimanov, V.V. Vedenyapin, H.-O. Walther. The Seventh International Conference on Differential and Functional Differential Equations, Moscow, August 22–29, 2014, was held in the Peoples' Friendship University of Russia jointly with the Steklov Mathematical Institute and Moscow State University. This conference became a satellite of the International Congress of Mathematicians in Coex, Seoul, Korea (ICM-2014). About 230 mathematicians participated in the conference, including over 50 of them from foreign countries. The lectures were also given by such well-known mathematicians as O.N. Ageev, C. Bandle, C. Bardos, J. Batt, H.G. Bock, V.M. Buchstaber, I. Capuzzo Dolcetta, A.A. Davydov, M. del Pino, S.Yu. Dobrokhotov, Yu.A. Dubinskii, A.V. Fursikov, R.V. Gamkrelidze, H. Ishii, W. Jäger, V.Yu. Kaloshin, E.Ya. Khruslov, A. Kozhevnikov, V.V. Kozlov, S.B. Kuksin, A. Neishtadt, S.P. Novikov, P.I. Plotnikov, A.G. Sergeev, M.B. Sevryuk, I. Shafrir, A.E. Shishkov, V.D. Stepanov, T.A. Suslina, I.A. Taimanov, A. Tesei, D.V. Treschev, L. Veron, H.-O. Walther, J. Wei. All of these conferences are remarkable not only for their scientific programs but also for cultural programs. In order to emphasize the periodicity of the conference, since 2005, it was decided to include the number of the conference in its title. A.D. Myshkis (1994), O.A. Oleinik (1999), D.V. Anosov (2002), D.V. Anosov and Yu.S. Osipov (2005), D.V. Anosov and Yu.S. Osipov (2008), D.V. Anosov and A.L. Skubachevskii (2011), A.L. Skubachevskii (2014). The advertency of the members of the Organizing Committees made the participation in the conferences pleasant and comfortable. It is worth pointing out the following mathematicians having contributed a lot in the organization of those conferences: E.I. Galakhov, P.L. Gurevich, E.B. Kuznetsov, A.B. Muravnik, V.A. Popov, A.A. Puntus, L.E. Rossovskii, A.M. Selitskii, R.V. Shamin, A.L. Skubachevskii, E.M. Varfolomeev, V.G. Veretennikov, A.B. Zhizhchenko.